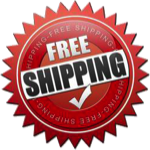 All prices in our store include standard ground shipping via US-Mail Priority for free! If you need faster or different delivery options, we have competitive rates on all UPS services. WindowCanvas stock designs are printed and shipped within one business day of ordering. Many even go out the same day. We also offer expedited shipping options so if you forget a birthday or holiday we can help you out. All WindowCanvas rear window graphics are warranted against defects in manufacturing for the lifetime of the product. Warranties are for product only and limited to the value of the replacement product. Neither seller nor manufacturer shall be liable for any damage, expense, or consequential damage arising out of use or the inability to use the product.